When I so blithely announced that I was “back in the saddle,” I hadn’t realized yet that they use an English saddle here rather than the Western saddle to which I have become accustomed. There’s no pommel on an English saddle, so I’ve been falling off quite a bit…..by which I mean, I’m using a gas stove rather than an electric. 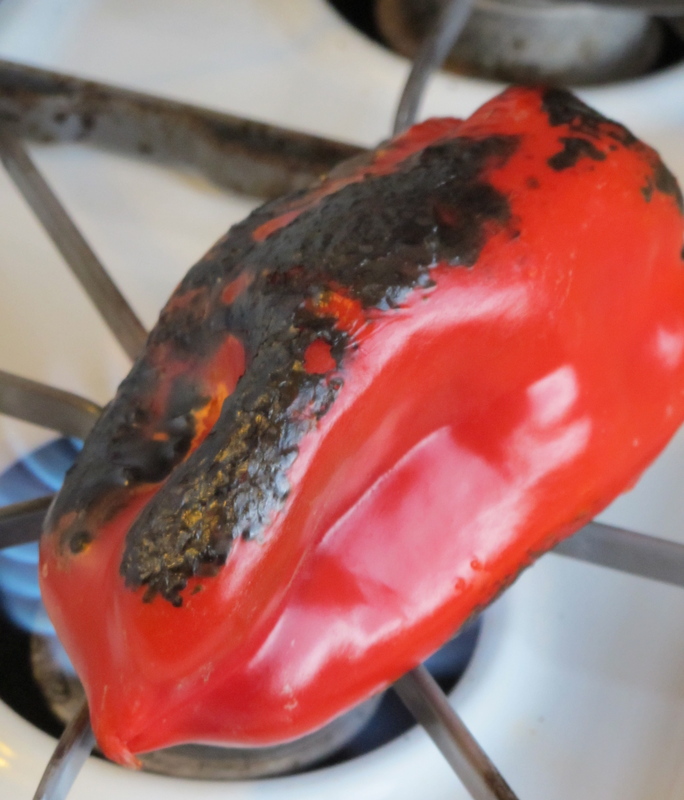 I really like the gas stove, and I’ve already been charring red bell peppers over the flames and flame-broiling toast and mackerel under the broiler. But it performs very differently than the electric range I’ve been cooking with for ten years, sort of automatic vs. stick shift ; so for every lovely pork roast or chicken emerging burnished and toothsome from the oven, there is a charred and crusted rice pot and a grimly overcooked pan-fried flounder supper that will remain forever my secret shame (and as a lingering odor in my apartment, if not forever, then at least for a long time). That is one fierce little hob! I’m not accustomed to the heat that a gas hob emits and the speed with which things come to a boil, then boil over and then, inevitably, burn. When the contractor finally deigned to make an appearance last week to hang the doors on The Beast in the kitchen, he blustered in saying “it took us so long to get the doors because they have to be perfect” and then left a fellow named Delfino to do the work, ostentatiously instructing him not to make any mess, do a good job, make sure she’s happy, etc. I had to restrain myself from poking him in the forehead with my index finger to see if I could puncture that bloated sense of self-important swagger. Unsurprisingly, the doors and frame that were so long-awaited for their perfection were only 2/3 the height of the space they were meant to cover, so I made an executive decision to ditch the doors and just finish all of the raw wood with trim and then cover the bottom with some kind of curtain. 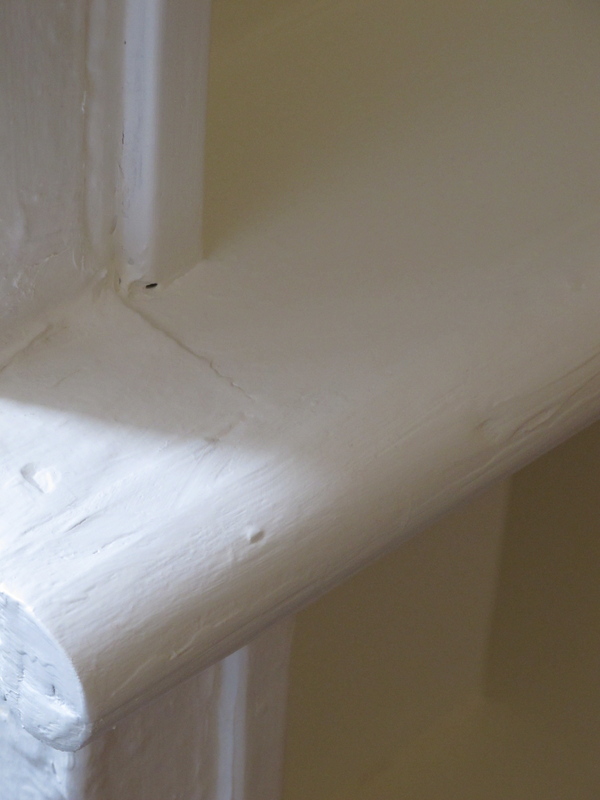 We fabricated a bullnose edge for the counter-height shelf out of two pieces of quarter-round and a flat piece of trim which were glued, nailed and screwed together and then caulked all of the seams. I’ve painted it with a couple more coats of white paint. 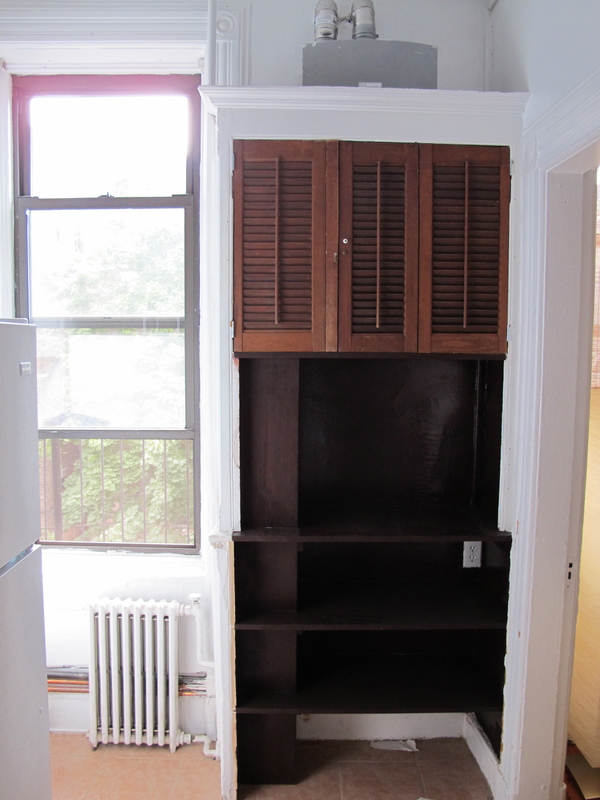 So, it’s not what it once was, but it’s the best that Delfino and I could do with a tiny saw blade, a utility knife, a caulk gun, and my expertise. And it’s miles better than the brown horror that was there when we moved in. Waiting for the paint to dry, I took a break from construction and unpacking and caught a bus ride through the Lincoln Tunnel into the NY Port Authority terminal, then walked across on 42nd street to Grand Central Station to visit Penzey’s Spices. 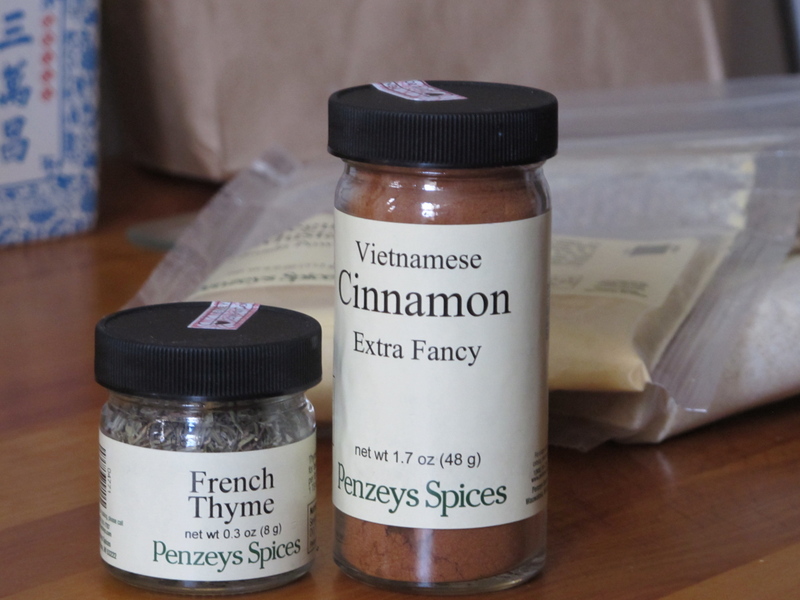 My sister’s recent post about stocking her spice rack in Vietnam reminded me that Penzey’s carries Vietnamese Cinnamon (Extra Fancy) which I had heard tastes like my Favorite Candy Ever, Atomic Fireballs. The very knowledgeable and helpful counter staff allowed me to smell jar after jar of cassias and cinnamons for comparison. I ended up with a big jar of spicy Vietnamese cinnamon, a small jar of French thyme, and a bag each of dry mustard and Malaysian Sarawak white peppercorns. Swag in hand, I wandered back through the beautiful Grand Central Station, which, if you can walk through and not want to take a train trip with a steamer trunk, I’m shocked and appalled, then meandered back across Midtown. I watched Bryant Park’s transformation from summer to winter- wear (they were installing the ice skating rink and little glass holiday shops) while eating a very drippy and delicious gyro (by the way, why does everyone say Jeye-row here?) and shooing away the pigeons. It was a pretty ideal (for me) shopping trip into Manhattan. It’s beginning to feel nippy here, and the tops of the trees outside my window are getting a little rusty looking. Fall is establishing a firm bulkhead here and I’m hoping I can figure out the foibles of my new kitchen in time to do some cool-weather cooking. I guess the thing about getting back in the saddle is that you might have to do it a few times before you can actually get some forward momentum going. It’s possible that cooking classes could be arranged…..we can talk. I find your tribulations amusing from the point of view that I grew up using a gas stove (I use that term loosely) and never had to “cook” on an electric until my first apartment in PTC. My mother has spent 60 odd years cooking on a gas stove up until last year. She does not like the electric part, and was less than amused when we lost power at her new house Christmas morning while she was making the traditional breakfast. The good old gas one keeps cookin sans electrical power… and that comes in handy. Don’t get me wrong. I really like cooking with gas and actually used gas when I was a kid, but using an electric range for the last 15+ years has put me out of practice. It’s much harder to make those round grilled cheese sandwiches or toast marshmallows on an electric stove! I have yet to come across cinnamon here except in the slippers my friend bought. I’ll look for it today. It reminds me, though, of the cheese names. They have Tasty and Extra Tasty. I think there’s one other degree of tastiness, but I can’t remember right now. Glad you’re back. I’m learning a gas stove too. Based on my purchase of “Extra Fancy” cinnamon, I’d have to say go for the Extra Tasty cheese. I think that “Extra”just adds a certain sumpin’ sumpin’ to your cheese eating experience. And if that other degree is “Less Tasty” I’d just say forget it. Get a flame-tamer thingy to sit on the gas burner. Gotta have that for stews and such. “Thingy” is the technical term. David, I’m grateful for your suggestion, but am running across an overwhelming number of options! Do have a preferred material (aluminum, cast iron, etc) that you’d care to promote in the interest of less burnt rice at my house?